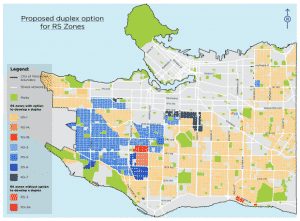 In a move to increase Vancouver’s supply of housing, City Council recently approved a new zoning policy that permits duplexes in 99% of single-family neighbourhoods. That adds up to about 67,300 of the 68,000 lots in Vancouver – or, 57% of its land mass. The policy change came after two days of public hearings in September that resulted in a 7-4 vote. It’s one of the first big initiatives from the City’s Making Room Housing Program. Launched in May 2018, it was created to provide more housing choice within neighbourhoods for families, downsizing seniors, and others seeking housing that sits in the ‘missing middle’ between single-family homes and higher density housing. The new zoning is believed to be a first for Canada. However, in the U.S., both Portland and Minneapolis have also recently taken steps to increase density in single-family neighbourhoods by voting to allow duplexes and triplexes. Here, we’ve broken down what the change means. In Vancouver, there are a lot of high-density buildings (apartment towers), as well as a large portion of the city that’s zoned for single-family housing. 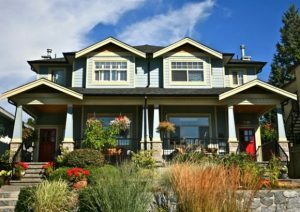 Middle-class families who can’t afford to buy a detached home but need more space than a condo have very limited options. The rezoning aims to fill the gap between the out-of-reach detached houses and condos and townhomes that are often too small by allowing the 67,000+ lots currently zoned for single-family housing to be rebuilt as duplexes. With the old system, single-family zones allowed 3 units on one single-family lot: a house with a secondary suite and a laneway house. Now, it’s legal to build as many as 4 housing units: each duplex can now have its own secondary suite. You still can’t build a duplex with a laneway house, though. Duplexes were already permitted in neighbourhoods like Kitsilano, Strathcona, and Grandview Woodland. The new policy expands them to areas like Dunbar, Kerrisdale, and West Point Grey. The one area that’s excluded is the single-family areas located between West 37th and West 49thAvenues, from Granville to Cypress Streets, as it’s mostly comprised of large, irregular lots with a significant stock of character homes. It’s a single home that’s been divided in two. Each unit has its own kitchen, bedrooms, bathrooms and separate entrances. They can be placed side by side, or on top of another—depending on the layout. Most supporters of the new zoning agree that allowing duplexes will only lead to modest change at best. Since the cost of a duplex in Vancouver still ranges from $1 to $2 million, it won’t do much in terms of affordability. Critics argue it will ruin the character of neighbourhoods, diminish green space, and lead to parking problems. Some also say single-family homes will be targeted by speculators, which could increase home prices. While the impact of the new zoning changes remains to be seen, it’s pretty clear that the new duplex rules are a small step to address a huge housing crisis. You might remember that Vancouver took a similar step in 2009 by allowing laneway units to be built on most single-family lots. Only 3,000 have actually been built since then. The move was one of Mayor Gregor Robertson’s last major decisions before he leaves office. 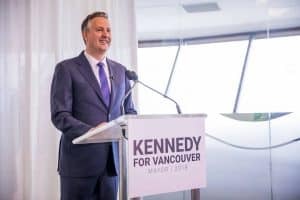 Mayor-elect Kennedy Stewart says the decision to rezone single-family neighbourhoods to allow duplexes should have been left for the next council to decide. But he does believe duplexes bring more affordable options for first-time homebuyers while retaining neighbourhood character—and intends to work with the decision. What else is Stewart proposing beyond duplexes? Take a look at our summary of his plan to address housing affordability below. Former NDP MP Kennedy Stewart has been elected mayor of Vancouver—becoming the city’s first Independent mayor in more than 30 years. Like the rest of the candidates, Stewart made housing affordability his primary campaign focus. Specifically, he promised to build 85,000 units of nonprofit, rental and marketing housing over the next 10 years. Here’s a snapshot of what Stewart plans to get started on when he’s sworn in on November 5. 25,000 new affordable rentals, run by non-profits on city-owned land, will be geared toward households earning under $80,000 a year. 35,000 new condominiums, coach houses and townhouses for purchase. To protect 6,000 cooperative housing units by renewing city-held leases. More opportunities for homeowners to develop their own properties—including expediting the construction of triplexes and fourplexes on standard lots and removing barriers to converting large homes into multi-family residences. A faster permitting process though increased staff and less red tape. Triple the empty homes tax—which currently stands at 1% of a property’s assessed value. 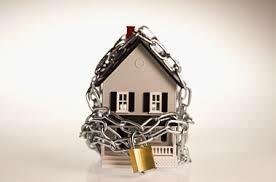 Protect between one-third to one-half of all new homes from foreign speculation. Bring in tough new conflict of interest rules and a lobbyist registry. 25,000 new purpose-built rental apartments and laneway homes. Creation of a renters advocate office to make sure tenants are treated fairly and to stop renovictions. To use new rental zoning powers to build secure rental housing developments and renovations.